I thought I would share some holiday gift guides for the upcoming Christmas season – here’s the first one! Of course being a cook and baker I love kitchen gadgets. About 6 years ago I received my very first KitchenAid mixer. I had just begun my baking blog and venturing into the world of cooking and baking. I’ve said it before, my dad was one of my inspirations for cooking. He himself was an amazing Italian cook, having owned and operated a few restaurants in downtown Vancouver when he was younger. It had only been our fourth christmas without him. I had wanted a mixer for a while, using only my small hand beater for whipping up frostings and cakes. Christmas Eve morning I was making dessert for dinner when my brother and mom came into the kitchen. Nick saw me using my small hand mixer to bake and said “Don’t you have anything better to use?” jokingly. 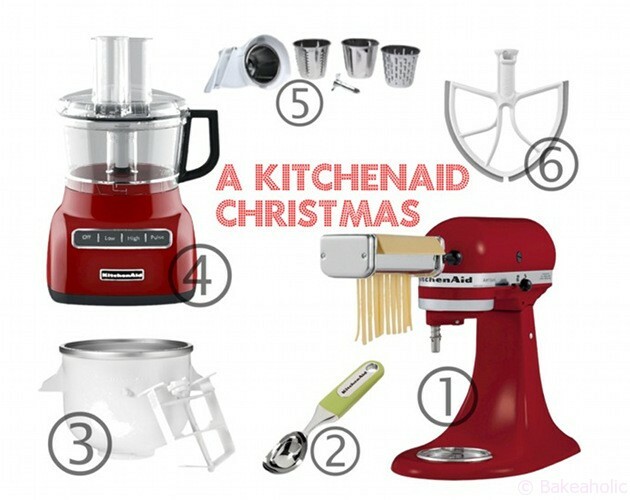 I replied “HA – yeah if I could afford a KitchenAid! Are you going to buy me one?” sarcastically. Knowing full well that they were a pretty expensive investment and I had no intentions of getting one anytime soon. Later that night at my Zia’s we were opening gifts after our Feast of Seven Fishes and my brother brought in a large wrapped box and said it was for me. I unwrapped it only to see KitchenAid on the box. It was my very first stand mixer. A shiny black KitchenAid Artisan mixer. I cried. Seriously. I was shocked that my mom and brother bought me something so huge. I think I was the only 20 year old who cried over a small appliance. Since then I upgraded my mixer to the Professional 5 Pro Series with the lift bowl. It’s bigger and more powerful. However, for a first stand mixer the Classic or Artisan are great. There are lots of great attachments as well. Personally I have the Ice Cream Maker, Pasta Roller and Grater. Another great investment is a Food Processor. It’s not a blender – it’s much different. I use mine almost daily for slicing, making pie crusts and fillings, pureeing and chopping. I have the 7-cup, but could definitely use a 9-cup. I also have a KitchenAid Blender (not pictured) that I love to use for smoothies and soups. Perfect for any Foodie on your list this Christmas. You have enlightened me! I had no idea there was a slicer attachment for the kitchen aid mixer. Yay – onto my Christmas list!